Some fees apply for some events. Events going on all around Mason! More events are still being added! Check at MACC’s HT-USA Visitors Center or go to the Events Calendar at www. masonchamber.org for the latest information! 18th annual MACC Raffle, Part B; Winter, RL#, $5 ticket blitz going on throughout the festival weekend, look for Chamber volunteers at many festival events! 9 AM to 4:30 PM. Rain or shine. Thursday Night Live Courthouse Concert in downtown Mason on the Ingham County Courthouse lawn at 6 PM. Bring lawn chairs/blankets. Presented by Independent Bank. Hot dogs, chips and pop sold by Mason Optimist Club. Weather permitting. Mason Farmers Market on west side of Jefferson Street in front of Commercial Bank Mason from 5 to 7 PM. Rain or shine. “Fall Family and Fido Walk” on the Hayhoe Riverwalk sponsored by CAPEX Land Company starts at Ash Street across from the pavilion above Lee Austin Park by the railroad tracks hosted by MACC. Free. Weather permitting. Mason Firefighters Association Pancake Breakfast at the James Pelton Memorial Fire Station, 221 W. Ash Street, Adults $8, Seniors $7, Kids $5, Family $22, under age 2 free, 7 AM to 11 AM. 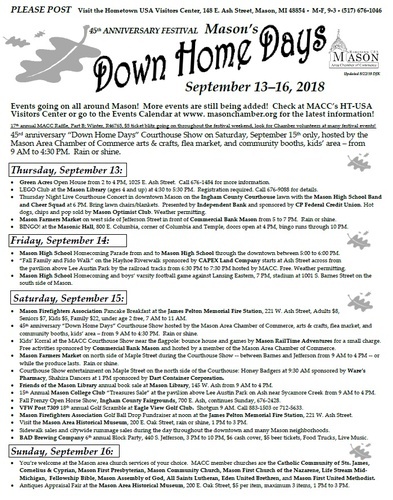 46th anniversary “Down Home Days” Courthouse Show hosted by the Mason Area Chamber of Commerce, arts & crafts, flea market, and community booths, kids’ area – from 9 AM to 4:30 PM. Rain or shine. Kids’ Korral at the MACC Courthouse Show near the flagpole: bounce house and games by Mason RailTime Adventures for a small charge. Free activities sponsored by Commercial Bank Mason and hosted by a member of the Mason Area Chamber of Commerce. Mason Farmers Market on north side of Maple Street during the Courthouse Show -- between Barnes and Jefferson from 9 AM to 4 PM -- or while the produce lasts. Rain or shine. Friends of the Mason Library annual book sale at Mason Library, 145 W. Ash from 9 AM to 4 PM. 15th Annual Mason College Club “Treasures Sale” at the pavilion above Lee Austin Park on Ash near Sycamore Creek from 9 AM to 4 PM. You’re welcome at the Mason area church services of your choice. MACC member churches are the Catholic Community of Sts. James, Cornelius & Cyprian, Mason First Presbyterian, Mason Community Church, Mason First Church of the Nazarene, Life Stream Mid-Michigan, Fellowship Bible, Mason Assembly of God, All Saints Lutheran, Eden United Brethren, and Mason First United Methodist.